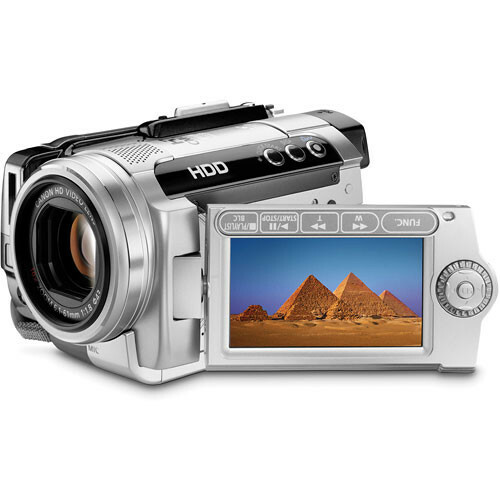 The Canon VIXIA HG10 High Definition AVCHD HDD camcorder combines a 40GB internal memory, 1920 x 1080 Full HD CMOS sensor, and DIGIC DV II technology. The 40GB HDD allows for up to 15 hours of record time in LP mode while the CMOS provides for true-to-life color rendition even in low-light. The DIGIC DV II technology further improves color reproduction, especially in skin tones while at the same time reducing image noise. The 2.7" multi-angled vivid widescreen LCD enables you to shoot with the LCD screen at any angle and still be able to see what you're recording. The SuperRange optical image stabilization offers more image stability than previously available on other camcorders. The 24p provides rich, movie-film quality for your videos. The HG10 is small enough to fit in your pocket or bag, allowing you to take it anywhere you go. Canon's compact design also provides for ease of use and ergonomic comfort when recording, giving you a camcorder that looks and feels smart. The 40GB hard drive allows you to shoot 1920 x 1080 HD resolution video for hours without having to change your recording media. You can record up to 15 hours in LP mode and five and a half hours in super high quality mode. No matter which mode you decide to shoot in you are virtually guaranteed to have more than enough memory. Canon designed and manufactured this 1920 x 1080 HD CMOS Sensor. The sensor provides high color resolution and advanced color production, giving you brilliant results. Canon's proprietary noise reduction technology makes all images crisp and sharp. The RGB Primary Color Filter with Bayer Replacement Pattern separates light into Red, Green, and Blue color components, giving your images rich, true-to-life color reproduction. The RGB filter is excellent with low-light as well, providing for impressive image capture. DIGIC DV II is the follow up to the original DIGIC DV, having been made exclusively for HD cameras. This technology ensures optimal image quality not only for your video but for your still images as well. Improved color reproduction, hybrid noise reduction, and crystal clear HD images are all benefits of DIGIC DV II technology. You can shoot up to five still images per second (3.1 Mp). The DIGIC DV II also lowers power consumption, allowing for longer battery life. Canon's SuperRange has the bases covered when it comes to image stabilization. Unlike other optical image stabilization (OIS) systems, SuperRange OIS gives you a steady shot without a loss in image quality. You are also afforded stabilization through a wider range of camera motions. Vibrations from a moving vehicle, hand held recording, body sway, and the occasional bump are corrected for. SuperRange OIS on the HG10 can be used for both your video and still shooting. Obtain the film look and feel when you elect to shoot in 24p mode. The HG10's 24p allows you to shoot at the same rate as movie film. Tones and colors can also be enhanced when you use the CINE setting. You can capture still images from your recorded video footage and store them onto a miniSD card for easy transfer to your PC or compatible printer. The 2.7" multi-angle vivid widescreen LCD on the HG10 gives you more flexibility than before by allowing for a wider range of viewing angles, making it possible for you to see the LCD screen accurately, no matter what angle you want to record from. The anti reflective surface and improved color reproduction, cause what you see on the LCD screen to be truer to what you're actually capturing. This feature also allows for less glare and better contrast, making it possible for more than one person to see what is on the screen. The Canon HG10 comes with a bundled software suite from Corel. WinDVD SE lets you play back your recorded video on your computer as well as edit in AVCHD. With the Corel Application Disc, you can use DVD Moviewriter SE when you're finished editing to burn your video onto either a full size AVCHD DVD or standard definition DVD. Use Canon's Print/Share to print directly from your HG10 to select Canon printers or any PictBridge-compatible printer using the included USB cable. Hit the Print/Share button on the camcorder to start printing your images without having to use a computer. When connected to a computer all you need to do is hit the Print/Share button to immediately transfer your photos to the computer. VIXIA HG10 High Definition HDD Camcorder is rated 4.5 out of 5 by 69. Rated 5 out of 5 by Anonymous from Great Camera & Good Service Easy to use, great features including white balance and custom camera settings, sharp HD videos and good photos. Had a problem with the hard drive going down shortly after purchase. Disappointing not to have it for a vacation trip, but the authorized service center fixed it promptly and returned it. No problem for me since it was handled well, and rare glitches with even a great product can be expected. Purchased a second higher-capacity battery and have had all the time I need between the two. Just wish consumer camcorders had a locked fade-in/fade-out so you didn't have to select it each time. Not a con since no camcorder I have seen has it. Rated 5 out of 5 by Stanta from Suprisingly good for a tiny camera I use this camera in church for its low light performance and when tested side by side with the JVC GZ-HD7, the Canon HG10 outputs a brighter, cleaner & more natural coloured video than the JVC at the same aperture & shutter settings. Its lens is good but unfortunately loses light upon zooming, which is the standard for most video lenses except the JVC GZ-HD7. However for a camera that has better colour, more light sensitivity, cheaper, has flash, has a video light, takes better pictures and is almost half the price of the JVC HD7, I am kicking myself for not delaying my 1st purchase. Rated 5 out of 5 by Mightyfletch from Works great with Final Cut Pro 6 To work with this camera in Final Cut Pro 6, it is just as easy, if not easier than capturing with a Firewire MiniDV cam. In play mode and the power connected, connect your HG10 to the Mac via USB. In your project, select the Log and Transfer option, select preferences, and select Apple intermidiate codec under AVCHD. Make sure your scratch disk is set, and drag and drop the desired clips into the queue where it reads Drag media here. The clips will transfer into the project bin, and you'll be ready to edit. Go to Canon's support site and search for help with Final Cut Studio 2 if you need more direction. Rated 3 out of 5 by Esteban Rojas from Good Camera but not ready for Macintosh Everything that everybody else is saying it's true. The image rocks, the size it's great, even the battery life is long. But try to capture your files using a Mac. YOU CAN'T. Final Cut don't support this kind of files yet. So you're gonna have to download this very specific software to encode your .MTS files (this cameras native format) to apple readable files. If you are a Macintosh user, wait a little longer before you buy it and learn about it. I didn't. Rated 1 out of 5 by Anonymous from TERRIBLE. I would give zero stars if I could. The camcorder was fine for 8 months. During that time, we took it to the beach once for 10 minutes to take a few pictures. We treated it like a jewel. It had not a scratch on it. One day, months after our trip to the beach, the buttons all froze. Sent the camcorder in and have simply had the worst customer experience. Canon claims that the camera is beyond economical repair and that there was severe sand damage. Hmmmm. Anyway, it has taken about 10 calls in over a month-long period to get them to send my camera back. They have the worst customer service I have ever experienced. I would NEVER recommend anyone buy a Canon product. Rated 3 out of 5 by AlexanderB from strong camera, weak software The high level of quality is spoiled by the absence of appropriate software for editing. Movie Factory (which goes whith the camera) doesn't have even basic, elementary editing tools and there are no programs for converting H264 format in .avi. I was looking for the converter for almost 2 weeks. And only after this I could load my clip in the editing program. So the software is extremely uncomfortable and unsuitable. The conclusion: Canon couldn't provide converter and editing progtam for the new format. That's huge disadvantage. I'm unsatisfied. Not particularly with the camera but with the purchase in general. Rated 4 out of 5 by Anonymous from I am completely satisfied! I have been using this camera for a few weeks and really like what it has to offer. Some of the functions are a little hard to find the first time and I think the manual could be a little easier to read. I like the fact that I don't have to mess with tapes anymore! The battery life seems to be pretty good but I think I will purchase another one to match the long recording time of the hard drive. The zoom buttons are a little different for me beings I am used to a wheel instead of toggle buttons. Overall I'd recommend this to anyone who shoots casual sporting events as well as childrens activities. Rated 5 out of 5 by kevlarorc from Awesome Camera! I have used this camera for some basic outdoor tests as well as used it to film at an event. PROS: The 40GB HDD is awesome. It keeps your clips separated so you can edit easily and can record for long stretches. Taking photos in the midst of recording is a cool feature. I also like the white balance settings as well as the manual focus. Also it has threads on the front so you can attach filters and lenses. The rocker zoom feels a lot better than the flimsy HF10 zoom. CONS: Can't take stills during playback of clips. The viewfinder only slides out but doesn't tilt upward. The light is pretty worthless so don't expect to do much filming in the dark.